WEST LAFAYETTE, Ind. — Purdue University scientists were part of a historical event this 4th of July as scientists working on the biggest international experiment in particle physics history announced the discovery of a new particle that may be the long-sought Higgs boson. Purdue's particle physics group has been a part of the more than two-decade search for the elusive particle, which could confirm the Standard Model of physics and provide insight into how the universe formed. 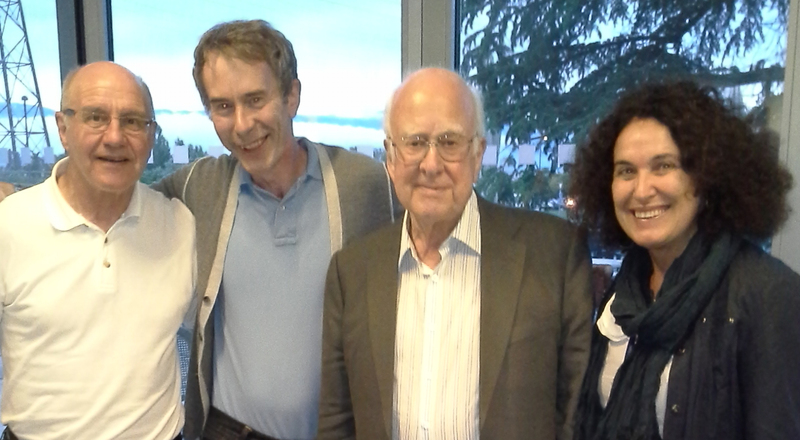 Daniela Bortoletto, the Edward Purcell Distinguished Professor of Physics, and Ian Shipsey, the Julian Schwinger Distinguished Professor of Physics, attended the announcement at the European Organization for Nuclear Research, or CERN, laboratory in Geneva, Switzerland. "On a day where fireworks lit up skies across America, the world of science unveiled explosive news concerning the longtime elusive Higgs boson particle," said Shipsey, who also is the co-coordinator of the Large Hadron Collider Physics Center at Fermilab, near Chicago, and was recently elected chair of the Compact Muon Solenoid Collaboration Board at CERN. "More data are needed to establish whether this new particle has all the properties of the Standard Model Higgs boson or whether some do not match, which would imply new physics beyond the Standard Model. Either way we've discovered one more key to unlock the mysteries of the universe." The announcement was received with cheers during a joint seminar at CERN and the ICHEP Conference in Melbourne, Australia. The results came from experiments using the largest machine ever built by mankind, the 27 kilometer-long Large Hadron Collider or LHC. Superconducting magnets that drive the collider are kept at 1.9 Kelvins, colder than outer space, and billions of protons traveling near the speed of light collide at the world record energy of 8 trillion electron volts. The energy of these collisions transforms into tiny subatomic particles, which may never have been seen before and some of which live for only one-trillionth-of-one-trillionth of a second. The Compact Muon Solenoid is one of three detectors at the LHC that captures traces of these tiny particles. It is, in essence, a 14,000-ton camera the size of a four-story office building that almost completely surrounds one section of the collider and takes up to 40 million pictures every second. Purdue scientists and students contributed to the design and construction of several key parts of the CMS camera, the software used to operate camera and analyze the collisions, and have contributed to a variety of key measurements with the data. Bortoletto and Shipsey led the camera design and assembly teams. Purdue physics professors Virgil Barnes and Laszlo Gutay contributed key design features to two major components of the detector: the Hadron calorimeters, which detect showers of particles coming from high energy quarks; and the Muon detectors, which detect heavy relatives of the electron. Bortoletto also is the upgrade coordinator of the U.S. CMS and is responsible for coordinating the 47 U.S. universities working to upgrade the CMS camera. In addition, Purdue physics professors Matthew Jones, David Miller and Norbert Neumeister are part of the international CMS team, and 20 other Purdue personnel, including engineers, scientists, post-doctoral researchers, graduate students and undergraduates have participated in the experiment. Neumeister, with close collaboration from Purdue's information technology group, also is contributing to the global distributed computing system that analyzed the data from the experiments. The Purdue CMS "Tier 2" data storage and processing center is the largest one of its kind among U.S. universities. Bortoletto has been involved in several of the analyses searching for the Higgs boson, and Neumeister and Shipsey have been involved in the internal reviewing process. Higgs bosons, if they exist, are short-lived and quickly decay into other particles. Because scientists cannot look directly for the particle, its discovery relies on observations of excess amounts of the particles into which it can decay. However, just as making change for a one-dollar bill can be done using different combinations of coins, Higgs bosons can decay into different combinations of particles. Bortoletto's group looked for evidence of specific subatomic particles that would result from one possible decay of a Higgs boson. To avoid any possible bias while analyzing new data and ensure objectivity when looking for much sought-after signs of new physics, physicists draw "blinds" over the region where an excess of decay events is expected, Bortoletto said. This region is only "unblinded" when they are satisfied enough with their procedures to give confidence in the ultimate result. "The moment the analysis was unblinded was amazing," Bortoletto said. "The excess at 125.3 GeV was easy to see, and we felt as though a major discovery was appearing in front of us. The statistical significance achieved was enough to be classified as a discovery. The probability of the background alone fluctuating by this amount is one in three million." 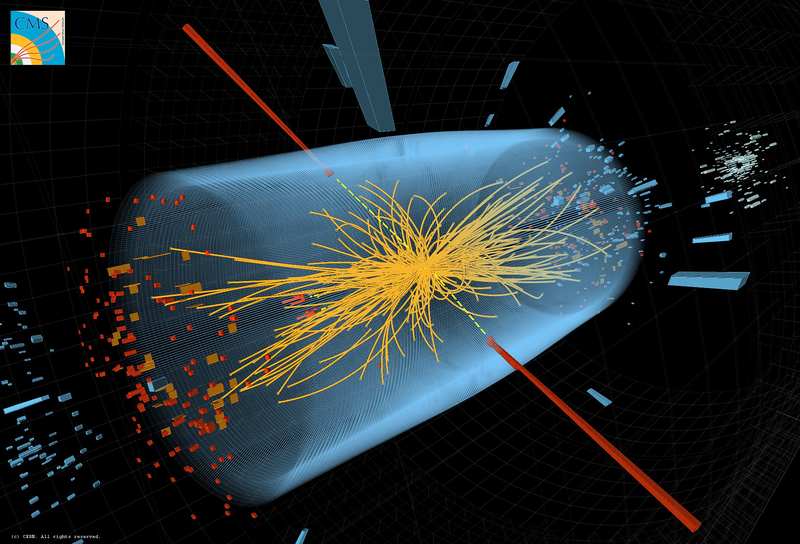 CMS reported observations consistent with expectations for the Standard Model Higgs boson. The results were found with a statistical significance of 4.9 sigma, a unit of standard deviation, which means scientists are 99.99997 percent certain of the discovery. The Standard Model of particle physics describes the basic building blocks of matter and their interactions, and its explanations of elementary particles and forces have held true through more than four decades of experimental testing. The Higgs boson remains the only missing piece of the model and, without it the critical component of how these particles obtain mass cannot be explained. "The Standard Model Higgs would tidily complete the Standard Model of particles and forces," Barnes said. "However, the very precise and successful Standard Model does not explain all that we have observed." It does not give us guidance on how to unify gravity with the other known forces of nature, explain why there are exactly three pairs of quarks and three generations of leptons or explain why the third generations are some ten-thousand times heavier than the first generations, he said. "There are some very appealing theories involving a whole host of new particles, some of which we are really hoping to find at the LHC," Barnes said. "It is not impossible that our new particle could be, for example, one of the postulated supersymmetric Higgses." The Higgs boson is named after Peter Higgs, a professor of physics at the University of Edinburgh, who first suggested the particle as the mechanism that gives mass to matter. Shipsey was a graduate student at the University of Edinburgh and attended classes taught by Higgs. This announcement was the first time Shipsey had seen Higgs in 20 years. "Peter was a brilliant teacher and all the students were in awe of him," Shipsey said. "However, he is an extremely modest person and is somewhat embarrassed that the particle carries his name. It was wonderful to see him again and share this moment with him." The LHC continues to deliver new data at an impressive rate. By the end of 2012, CMS hopes to have more than triple its total current data sample. 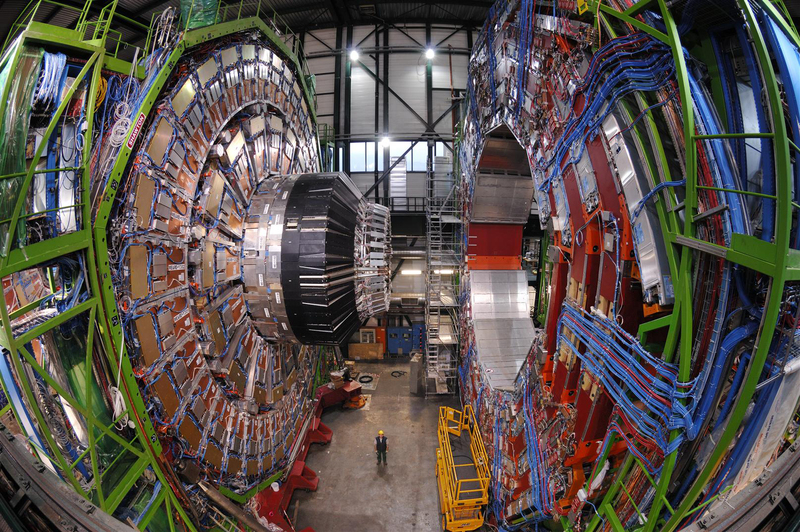 These data will enable CMS to further elucidate the nature of this newly observed particle. They will also allow CMS to extend the reach of their many other searches for new physics, Bortoletto said.